Joseph S. Benfield was born in Lincoln/Catawba County, NC Aug 20, 1807. He died Jan 23, 1884 in Nebo, NC. He married Eleanor "Nellie" Johnson in Mar 16, 1829. Eleanor "Nellie" Johnson was born in Mitchel County, NC Feb 13, 1810 and died Apr 15, 1885. Both graves are located at an old Benfield cemetary in a wooded area north of Goodman Lake near Oak Hill, NC area know as Quaker Meadows--off Hwy 18 between Lenoir and Morganton NC--which was land owned by Joseph S. Benfield during his lifetime. More information at bottom of page! 1840 - Joseph's name is indicated as head of household in NC census, living in Burke County, NC with wife Nelly and eight children. 1843 - Land grant #5545 for 50 acres on the waters of Upper Creek issued to Joseph Benfield. 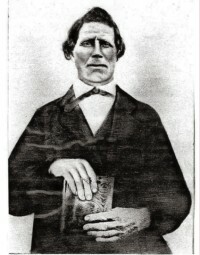 1845 To 1884 - leader in Smyrna Baptist Church. Several times a delate to the Baptist Association. Later involved in the founding of Zion Baptist Church--a missionary church of Smyrna Baptist--where he became a trustee of the church. 1855 - Joseph S. Benfield was appointed by the governor of NC to the lifetime position of Justice of the Burke County Court of Pleas and Quarter Sessions. 1864 to 1865 - Civil War years--Joseph S. Benfield, with 3 sons serving with the Confederate Army, Joseph S. Benfield remained a strong and vocal supporter of The Union (along with others in the area). 1865 - Joseph S. Benfield files a claim under the Act of Congress for allowance of a horse taken by Union troops during the last months of the Civil War. The claim is filed with the National Archives and is #1437. It includes responses from Joseph and Nellie and some of their children and neighbors. The claim indicates he owned 300 acres near Morganton, NC. 1868 - Joseph S. Benfield appointed to serve as a member of the Republican County Committee for Burke County, NC. Joseph was a strong Union sympathizer. He struggled with his feelings and had his loyalities tested. He conveyed some of his family's experiences in an April 1873 sworn deposition for his claim involving a mare stolen by Union Troops during Stoneman's raid. Both sides had stolen from the BENFIELD family, including another mare taken earlier by Confederate troops. Joseph told Stoneman's troops, "It seemed hard for both armies to take from me" Joseph said he tried to keep his sons out of the "rebel army" as well as "all the men in my settlement." He fed Union men who were keeping out of the "rebel army," as well as some Union soldiers who had escaped from prison in Charlotte. "Colonel Walton ordered his militia to begin burning my house on account of my Union sentiments, but it was not done. Some of the militia refused to burn it." Seven BENFIELD sons of Joseph S. served in the CSA: John Jackson; Joseph L.; Jackson Van Buren; Byard Henry; Doctor M.; William Harrison; and Waightstill Avery. Jackson Van Buren and Doctor M. Benfield died while serving in the Civil War.